The following are excerpts from the Pilot's Log book of 1st Lt Joseph Elden Leonard and flight summaries from “417th NFS Illustrated History," edited by Dan Whitney. 1st Lt. Leonard and his radar observer Flight Officer Raymond Christensen, were night fighters for the 417th NFS, U. S. Army Air Force. Both were killed in action when their plane was engaging a Nazi night fighter over the Tyrrhenian sea. Their plane disappeared from radar and presumably crashed into the sea after being shot down. F/O Christensen was my great-uncle. Much of the work of the 417th NFS was to protect boat convoys as they transported allied suppies and soldiers. As you can imagine, these convoys were prized targets of the Nazis. Also, the 417th were sent on missions to check out "bogies" that showed upon their radar, and if found to be an enemy plane, engage in combat. These excerpts resume in Tafaraoui, Algeria. F/O Christensen was radar observer for all of these flights, so I have not mentioned him specifically. Other passengers are noted. The quotes are from the flight summaries of 1st. Lt. Leonard. Notes between brackets are mine. All crews from the 417th are named "Bishop 50, Bishop 51," etc. Note the crazy hours these guys fly! These entries conclude the log book and flight summary data. Flight 1: Beau 151. Sgt. Sabo along as well. Night Fighter Training. 2:00 pm - 2:40 pm. "151 is undoubtedly the best A/C [air craft] on the line, everything checked up perfect, wonderful day." Flight 2: Beau 151. Convoy Patrol - Turban (Woodlog) [ground control]. 5:35 pm - 8:30 pm. "Convoy patrol on Turban, ran one PI [practice interception] with Bishop 57, seven mile range on the AI [airborne intercept radar], was vectored after bogie with negative results, had trouble with Woolsack and Frenchmen in the pattern, A/C [air craft] has slight hydraulic leak." Flight 1: Beau 177. Pfc. Coleman was along. Night Fighter Training. 2:20 pm - 3:00 pm. "NFT, ship and radio were OK, but AI [airborne intercept] was PP ["Piss Poor"]"
Flight 2: Beau 177. F/O Heinecke along as well. Practice interceptions with Woodlog. A.I. U/S. [airborne interceptions - ?/?]. 6:30 pm - 8:15 pm. "PI's with 50 on Woodlog, pretty good night despite the fact that my AI was U/S, ship and R/T [radio transmitter] were OK."
Flight 1: Beau 204, Night Fighter Training. 3:05 pm - 3:50 pm. "Night Fighter Training in the soup, very nice, A/C [air craft], R/T [radio transmitter], and A/I [airborne intercept radar] OK also." Flight 2: Beau 204, Convoy patrol with Fishbone [ground control]. 5:55 pm - 8:05 pm. "Convoy patrol on a helluva big job about 80 ships, nothing doing as usual and Joe Long was off the ball on his vector, A/C [air craft], R/T [radio transmitter], and AI [airborne intercept radar] OK."
Flight 3: Beau 204. Scramble. 2:20 am - 3:40 am. "Scramble after bandit that failed to materialize, I investigated a destroyer that turned out to be friendly, my first scramble and I get lost on the Taxi strip, C'est La Guerre ["That's war!"]. R/T [radio transmitter] a bit ropey." Feb 18, 1944. Beau 938, 2:15 pm - 3:05 pm. "NFT [Night Fighter Training] with [Bishop] 70, A/C [air craft] check out OK but engineering marked it out so they could play with it. R/T [radio transmitter] and A/C [air craft] OK."
Feb 22, 1944. Beau 158. 8:05 pm - 12:40 am. "PI [practice intercepts] with Bishop 53 on Stalecrust [ground control], we worked quilt at Angels 11 [altitude of aircraft - 11,000 ft] - the blackest damned night that I have ever seen. We were both getting visuals from 800-300 ft. Ship and set OK."
Feb. 23, 1944. Beau 151. 5:35 pm - 8:25 pm. "Convoy patrol with Perform [ground control], Bags of Oranges and Orange juice, uneventful as usual, ship and set OK, but it leaks." March 3, 1944. Beau 151. 7:55 am - 9:35 am. "Dawn patrol with Bradshaw [Tafaraoui RAF Aerodrome control]. After waiting 25 minutes for [Bishop] 57, Bradshaw vectored me after a bandit which I chased for about 25 minutes when my radio went out. I turned back and about 5 minutes later my port engine went out, but the radio came back in so I was vectored home, R/T [radio transmitter] OK."
When Elizabeth O'Neal suggested a Genealogy Blog Party, I was all in. (Thanks, Elizabeth!) The theme for the opening party was to create a time machine to visit an ancestor. 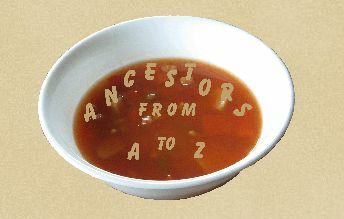 I truly did not feel there was any one ancestor in particular that stood out over the others, so I decided to sit this one out. Yes, it's a diary with the whole summer ripped out of the center. Not ripped, exactly, more like surgically removed with a sharp instrument. I immediately knew that if I could get that time machine, I'd zip back to 1934 and see what was going on for myself. I'd try to become my grandmother's new best friend and confidante. Yes, that diary belonged to my grandmother, Lillian Christensen, and anyone who knew her knew she could keep a secret, and take it to the grave if she had to. And obviously that's what she chose to do with the Summer of 1934. That block of time has been neatly removed from her life as if it never happened - May 5 through August 31. Whatever she was up to, she didn't want anyone to know about it. 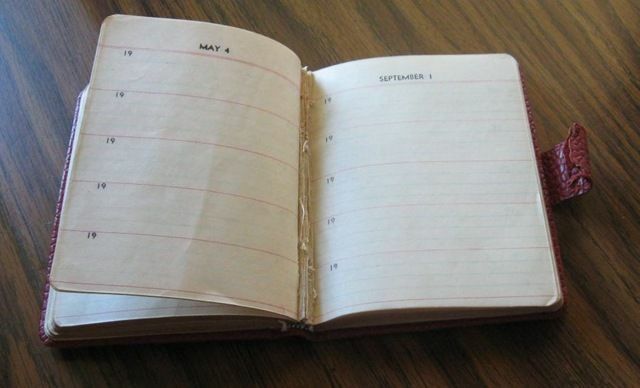 But why didn't she just destroy the whole diary, instead of leaving this blatant gaping hole in the middle? Because she wanted to torment me for being so nosey, that's why. My grandfather often told the story of how he and Lillian "claimed each other" in third grade (or was it second?) Once they laid eyes on each other, the rest was history, he said, neither of them ever looked at anyone else. Grandma never said anything while he was telling the story of his youthful little heart going pitter-patter at the mere sight of her. But then, Grandma's lack of involvement wouldn't have been surprising. He was the storyteller, she was the practical one. I never gave it a second thought... until now. 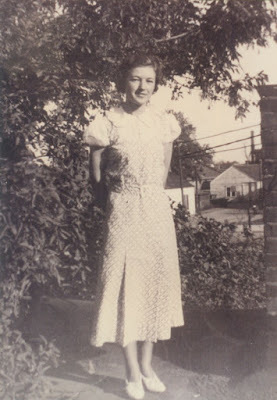 All I really knew of Grandma's young adulthood was that she was a nanny for awhile, then worked in the office of a government agency, and at some point had her own apartment. I had no timeline for any of these events. Thanks to old newspapers, city directories, and the diary, I've been able to put together some of the story. Her diary begins in January, with her living with the Hansowitz family, caring for the children and helping out around the house. She is dating my grandfather at the time, and makes references to what they're doing on the weekends. She was also doing office work during the day, and may have been working through a government program, as she mentions being shuffled from the court house to the post office and back again. And that's where the diary ends. Lillian Christensen is listed in the 1934 Huron City Directory with an address of 425 Wisconsin av. SW.
Lillian, on the roof of her apartment. So, I know exactly where she worked, and approximately when she started there. I know exactly where her apartment was, and I know her job must have been permanent or she never would have gotten her own place. (Yes, Grandma, I did listen to everything you told me on that subject). And while I still don't know exactly what she was up to during those missing four months, I'm getting a pretty good idea of the situation. Oh, did I mention that the letters she'd written back and forth with my grandfather have a huge gap after April of 1934? I'm going to keep going through her papers and letters looking for clues I overlooked. And I WILL figure this out, if there's any way possible. Flight 1: Beau 940. Sgt. Gura also along. Night Fighter Training. 3:25 pm - 4:40 pm. "NFT with [Bishop] 70 who returned with a bad engine so I stooged around and flew single engine for awhile." Flight 2: Beau 940. Practice interceptions with Woodlog [ground control]. 5:45 pm to 8:10 pm. "PI's with Woodlog and [Bishop] 59. Wizard control and a beautiful night. Ran three interceptions and the AI [airborne interceptor radar] was remarkably good. VHF [very high frequency transmission] and A/C [air craft] OK."
Flight 1: Beau 940. Night Fighter Training. 4:40 pm - 5:10 pm. "NFT with [Bishop] 59, my port transmitter went out and bismuth screwed the detail more than usual. A/C [air craft] and AI [airborne intercept radar] OK."
Flight 2: Beau 940. Practice interceptions (Woodlog and Perform were ground controls). 6:00 - 9:15 "PI with 53 on Woodlog - very good work on the part of Woodlog. They turned us over to Perform and we did convoy patrol with them until they vectored us in. A/C [air craft] and R/T [radio transmitter] OK."
Beau 177. Convoy Patrol (Woodlog and Perform ground controls) 10:30 pm to 2:30 am. "Convoy patrol with [Bishop] 53 on Woodlog who ran one PI [practice interception] and then turned me over to Perform who attempted to vector me on to a bogey which they had a plot on. He went home and so did I. Port receiver went out, otherwise OK."
Jan. 7, 1944. Beau 938. Practice Interception with Fishbone [ground control]. 06:10 am to 8:05 am. "PI with[Bishop] 53 controlled by Fishbone and was it ever lousy - 2 interceptions apiece. A/C [air craft], R/T [radio transmitter] and AI [airborne intercept radar] OK."
At this point, they moved to nearby La Senia, preparing for the big move to the island of Corsica. Flight 1: Beau 167. Also joined by Bernie Brun. Convoy Patrol. 5:40 pm to 8:00 pm. Squadron history reports a Nazi Ju 88 plane damaged by 1st Lt. J. E. Leonard off the Coast of Spain. "Convoy patrol with Fishbone [ground control]. Chased two P-39's and then noticed some gunfire from "across" then Joe Long vectored me on a fighter. Engaged the enemy twice and got hits on his tail the first time and got two hits on stbd wing. Got another contact and followed it to the coast of Spain. One Ju88 damaged. Cannon all fired. Chris [F/O Christensen] was on the ball. A/C [air craft] was perfect. VHF [very high frequency transmission] good. Everyone is on the ball I Oh! What a beautiful morning." Flight 2: Beau 941, Convoy Patrol. 7:00 am to 8:40 am. "Patrol on 'Links.' "C" Channel crystal went out. Beautiful morning. AI [airborne intercept radar] U/S." Jan. 13, 1944. Beau 938. Pvt. Schoenberg along as well. Night Fighter Training. 2:30 - 3:20. "NFT with[Bishop] 53. Canary check OK. A/I [airborne intercept radar], U/S and rheostat in gunsight U/S." Flight 1: Beau 938. Night Fighter Training. "NFT rather uneventful. Ship, AI [airborn intercept radar], R/T [radio transmitter] OK."
Flight 2: Beau 938. Don Barnhart also along. Convoy Patrol with Perform [ground control]. 5:45 pm - 8:00 pm. "Convoy patrol with Bishop 53 on Perform. 53 ran two PI [practice interceptions] whole damned thing was uneventful. Everything OK."
Flight 1: Beau 204. On patrol off Balearic Islands. 4:30 pm - 7:30 pm. "Patrol near the Balearic Islands which was rather fruitless but we learned a lot. Receiver went rather duff on the way out. AI [airborne intercept radar] and A/C [air craft] OK."
Flight 2: Beau 204. Sgt. Filipowics also along. Convoy patrol with Woodlog [ground control]. 12:55 am to 3:40 am. "Single plane patrol on "Nipper." Went to sleep three or four times; ears are still plugged up. A/C [air craft], R/T [radio transmitter] and ship OK."
Beau 941. Convoy Patrol (Woodlog ground control). 5:40 pm to 8:25 pm. "Convoy patrol with Bishop 70. My port receiver went out so came back on "C" for Charlie. Port engine rough." Flight 1: Beau 961. Night Fighter Training. 2:20 pm - 3:05. "NFT. AI [airborne interceptor radar] ropey and then went out. A/C [air craft] and R/T [radar transmitter] OK."
Flight 2: Beau 961. From La Senia to La Passet. "Alert at Lapasset. Did a dawn patrol and PI [practice interceptions] with [Bishop] 70 and returned to base after having had breakfast at Lapasset. A/C [air craft] OK."
Flight 3: Beau 961. Practice Interceptions with Woodlog [ground control]. Flight 4: Beau 961. LaPasset to LaSenia. Jan. 31, 1944. Beau 151. Duty: Tenacle. 4:00 pm - 7:50 pm. "Tenacle with no results, received Whitetooh, Bradshaw [Tafaraoui RAF Aerodrome control], Madbrain, and Oxter, landing ropey as usual, AI [airborne intercept radar] was out completely, A/C [air craft] was very good." Dec. 2, 1943. Beau 911, had passenger M/Sgt Swain aboard. Mission was [enemy?] Convoy Search. 4:40 pm - 6:25. "Went out to look for a convoy near Alboran and found another one instead. Also saw a small one while returning to base. Otherwise uneventful. Ship and R/T [radio transmitter] OK."
Dec. 4, 1943, Beau 911. Airborn Intercept Target. 10:10 - 11:30 AM. "[Acted as] AI target for [Bishop] 50 but his weapon bent* so I returned and pancaked [landed]." *plane, or some part of the plane, not working properly. During the time period between Dec. 4 and Dec. 13, the 417th upgraded from MK VI radar to MK VIII. Flight Officer Christensen was presumably training on the new equipment; 1st Lt. Leonard continued to fly with other radar observers during this time. They were based out of Reghaia, Algeria rather than Tafaraoui until later in the month. Dec. 13, 1943. Beau "B", also joined by F/L Quittenden and F/O Van Laecken. Airborne Interception practice. Flight 1: Beau "L", also joined by F/L Quittenden, F/O Potter. Airborne Interception practice. Flight 2: Beau 938, also joined by F/O Potter. Airborne Interception practice. Flight 3: Beau 938. Practice Interceptions with "Madbrain" [ground control]. Dec. 18, 1943. Beau "F", also joined by F/O Van Laecken. Acted as Airborne Interception target. Dec. 21, 1943. Beau 834, also joined by F/O Potter. Flight from Maison Blanche to Tafaraoui. 3:00 pm to 5:30 pm. "MB to TAF. Picked up at 155 MI. 834. Flight without incident." At this point, F/O Christensen and 1st Lt. Leonard are back at Tafaraoui. Dec. 26, 1943. Beau 938. Practice interception with Woodlog [ground control]. 5:30 pm to 7:00 pm. "PI's with [Bishop] 70 on Woodlog, but 70's radio went out so we returned to base. Bags of clouds." Dec. 29, 1943. Beau 834, also joined by Lt. Johnson. This mission was a somber one - searching for a missing aircrew (Swift and Kohrman) from their unit. 1:25 pm to 4:40 pm. "Search - no luck. Conducted square search in vicinity of Cape Figalo and searched north to 40-50 NE of Oran [Algeria]." Dec. 30, 1943. Beau 168. Practice interceptions with Fishbone [ground control]. 6:10 am - 9:40 am. "PIs with [Bishop] 59 on Fishbone with Joe Long giving vectors. Beautiful ship and beautiful interceptions. AI [airborne interception radar], R/T [radio transmitter] and A/C [aircraft] OK."
Nov. 1, 1943. Beau 806. Practice Interceptions with Stalecrust [ground control]. 5 am - 7 am. "Dawn patrol and practice interceptions with Stalecrust and Bishop 70, ran about 7 interceptions in all thru the clouds. Joe Howard was a little off the beam, ran into some low cloud, 700 ft., east of field, ship, R/T [radio transmitter] and AI [airborne intercept radar] OK."
Nov. 4, 1943. Beau 806. Patrol with Fishbone [ground control]. 6:05 pm to 7:25pm. "PI [practice interceptions] with [Bishop]70, but the oranges were sour [?] so 70 stayed on the ground. Patrolled with Fishbone giving the vectors. Cloud base at 7000 but 5000 over sea, A/C [air craft] OK."
Nov. 7, 1943. Beau 760. Patrol with Fishbone [ground control]. 5:00 am - 7:30 am. "Patrol with Fishbone and [Bishop] 59, Patrol, Patrol, Patrol, too tired to do PI [practice interceptions]. [Bishop]59, Damn him, shot me down when coming back to base. A/C [air craft] in good shape." Nov. 10, 1943. Beau 806. Practice Interceptions with Stalecrust [ground control]. 5:45 pm - 8:15 pm. "PI with Bishop 59 on Stalecrust with Joe Howard intercepting, made 5 interceptions apiece and got a beautiful workout from 59. My knees are stiff from kicking rudder, beautiful night, beautiful A/C [air craft] good R/T [radio transmitter] and AI [airborne interception radar] OK."
Nov. 13, 1943. Beau 814. Practice Interceptions with Stalecrust [ground control] at night. Nov. 16, 1943. Beau 760. Patrol with Fishbone [ground control]. 5:45 am to 7:50 am. "Patrol with [Bishop] 59, ran a couple of impromptu interceptions, had a dog fight, R/T [radio transmitter], A/C [air craft] OK. Weather fine." Nov. 20, 1943. Beau 819. Practice Interceptions, returned due to bad engine. 5:35 am - 7:09 am. "PI with Bishop 53. Stalecrust [ground control] did a fair job. My port engine went a little haywire and cut out several times. Instruments all checked up but it used about 100 gallons more gas than the starboard. Very cold, and they Africa is hot!" Nov. 21, 1943. Patrol duty. 5:20 pm - 8:15 pm. "Patrol with Perform [ground control] doing the vectoring. Uneventful as all hell. Ship, AI [airborne intercept radar], and R/T (radio transmitter] OK. The night was black, and hazy and black!" Flight 1: Beau 814. Practice Interceptions with Perform [ground control]. 6:15 am - 8:45 am. "PI with Bishop 70 on Perform. Bradshaw [Tafaraoui RAF Aerodrome control] really had their head up this morning. W. W. was really on the ball on 4 interceptions. Ship, R/T [radio transmitter], and AI [airborne intercept radar] were OK."
Flight 2: Beau 814. Navy Co-op. 1 hour, daytime. Nov. 28, 1943. Beau 819. Convoy Patrol. 5:00 pm to 7:35 pm. "Uneventful patrol of "Decode [name of convoy?]." Saw Wellington, one "Snowball" ship and 4 P-39's took a close look at me. Used flood for landing; best flood yet. A/C [air craft], AI [airborne interception radar] and VHF [very high frequency communications] OK."
Well, who would have guessed that when I sat down at the computer this morning to drink my coffee, that I'd end up breaking down a significant portion of the hardest brick wall I've ever encountered? Certainly not me, or I'd have brewed up a whole pot. Two years ago, I lamented on the difficulties I encountered while researching Michael Joyce. This latest chapter of the story actually started last week, when I knew I'd have a three day weekend with nothing planned. I "got off my wallet" and plunked down the $28 for monthly access to an Irish records database. I was searching for Michael Joyce, b. abt 1829 in County Galway, to "Pat Joyce" and "Rose Maden." I came up empty handed. No birth records, no baptismal records, no parents of anyone listed as Pat Joyce and Rose Maden. I searched every way I could think of. I did come to the conclusion, as I had expected, that "Maden" was actually "Madden," but learned little else. Because I couldn't quite give up, I left the browser, with several potentially pertinent tabs, up. This morning, I decided I'd putz around on the computer while I drank my morning coffee. I took a look at some of those browser tabs I'd left up last week, and started following links here and there, eventually ending up at FamilySearch. For kicks, I typed in Michael Joyce, and didn't get anything too exciting, but before I started the laundry I decided to type in "Patrick Joyce" and "Rose Madden" as parents, and left all other fields blank. I got one return - a death certificate for Bridget Cummings. Bridget's parents were listed as Patrick Joyce and Rose Madden. I dug into the life of Bridget Cummings a little deeper, and realized she was just six years younger than our Michael. My hopes began to rise, but when I realized that she lived and died in Clinton, Massachusetts, where our Michael lived after his arrival in the U.S., I had a strong hunch that I was on the right track. After collecting a fair amount of information on Bridget Joyce Cummings, I turned to Ancestry family trees. While I am cautious about information listed there, I like to get an overview of the family I'm researching, and potentially some clues. I saw on Bridget's timeline that she had a brother, Thomas, in Berlin, Wisconsin. I nearly fell off my chair - several years ago, we made a research trip to that area, as Michael lived in Berlin, and later moved to nearby Ripon, Wisconsin. In our research, we ran across records on this Thomas Joyce, but could not make a connection despite feeling that there had to be one somehow. Now, the hard part. I sent off a message to the tree owner, and I now am waiting for a response, although I think I already have the answer. I will dig out the information I saved on Thomas Joyce from Berlin, and try to find more documentation that he and Michael are of the same family. There's still more work to do, but it's good to know that Michael Joyce did NOT just drop out of the sky. Oh, and I'm going to brew up another cup of that coffee. And I'll do the laundry tomorrow. Beau #843. Practice interceptions. 11:00 pm - 1:10 am. "Ran a PI with Bishop 70 and made two interceptions. Bounced twice on first attempt to land, so I went around-starboard engine three fire when I gave it the gun. The mechanics checked up and found two stacks out." Flight 1: Beau #806, Night Fighter Training. 2:05 pm - 3:05 pm. "NFT with Bishop 70 who ran interceptions." Flight 2: Beau #822, Night Practice interceptions. "PI on Fishbone [ground control group] with [Bishop] 53, made 5 interceptions and controller was pretty damned good. 822 is still the best ship on the line except that the throttles are out a little. Beautiful night!!" Beau #822. Formation and Night Fighter Training. 1:30 pm - 3:30 pm. "Formation with [Bishop] 53, 56, 70 and it stunk! Ran NFT with [Bishop] 59 and checked canary with Stalecrust [ground control group]. A/C [air craft] fine." With Lt. Fitzgerald along as well. Beau #822. Practice interceptions and S/L [?]. 6:50 pm - 10:05 pm. "PI with [Bishop] 70 and Fishbone [ground control]and they made 6 interceptions - all gone but one. Both 70 and I went over to S/L and flew for about an hour. We both had S/L officers as passengers. S/L can really hold on to you if they find you." Flight 1: Beau #831. Night Fighter Training. 3:00 pm - 3:50 pm. "Finally found Bishop 55 for target and ran one interception. Set was very good. Beautiful clouds about 6500 ft. so I did a few steep turns and a buzz job on them, stooged around for awhile, then came in. At last - a good landing." Flight 2: Beau #831. Practice Interceptions with Perform [ground control group]. 6:50 pm - 10 pm. "PI with Perform with Bishop 65 as playmate. Al Withers did a very good job of Controlling, making 7 interceptions. Perform on the ball. (Al Withers). Pancaked [landed] at 2200." Flight 3: Beau #831. Capt. Lathrop joined. Practice interceptions with Fishbone [ground control]. 4:10 am to 7:10 am. "Bishop 63 [acted] as target. [Bishop] 65's set went out so he flew target for me. The controller made 5 interceptions that weren't too hot. Cloud layer at 10,000. Plane and AI [airborne intercept radar] Ok."
Beau #743, practice intercepts with Stalecrust [ground control]. 11:05pm to 1:40 am. PI on Stalecrust with Bishop 59 and had three interceptions apiece. My stbd [starboard] transmitter had a squeal in it so I used it to signal the controller with. The port tachometer was fluctuating from 200-700 rpm. And after landing it went out. Beautiful night." Flight 2: Beau #831, from Reghaia to Tafaraoui, 2:30pm - 5:40pm. "X-C [cross country] Reghaia and return time 1430-1740. Had two passengers going up and came back with observer only. The trip was uneventful and came back the water route which is pretty nice scenery. Radio and A/C [air craft] both in good shape. Logged 2:30." Flight 3: Beau #831. Practice interceptions with Stalecrust [ground control], 10:55pm to 1:40 am. "PI with Bishop 60 and Stalecrust. They were breaking in some new controllers and things were rather rough. My interceptions were without incident as the target did not use any evasive action. A/C [air craft] and R/T [radio transmitter] OK.
Oct. 22, 1943. Beau #822. Convoy patrol, then landed at Reghaia. 12:55 am. to 3:40 am. "On patrol with Perform [ground controllers] and was told to return to base. 80 miles from base Bradshaw [Tafaraoui RAF Aerodrome control] told me to go to Blida and Perform vectored me for there but Blida had me to go Reghaia. No damn sleep and a lousy breakfast. Sector said our field was closed in and I finally got fed up and took off anyway." Flight 1: Beau #822. Flew from Reghaia back home to Tafaraoui, 9:40 am to 11:00 am. "Reghaia to Tafaraoui, very uneventful. ceiling 1200 ft. over field." Flight 2: Beau #822. Night Fighter Training. Flew from 1:50-2:50 pm. "NFT with Bishop 59. Very uneventful. My canary checked very weak with Stalecrust] ground control]. A/C [air craft] and R/T [radio transmitter] both OK.
Oct. 25, 1943. Beau #822. Convoy Patrol with Perform [ground control], Flew from 11:20pm to 2:40 am. "Convoy patrol with Perform giving the vectors. Ran two interceptions but neither Bishop 59 or myself was on the ball so we called the whole thing off. Lots of oranges [?]." Flight 1: Beau #822, Night Fighter Training, 1:40pm - 2:40 pm. "Checked Canary with Stalecrust and Fishbone [ground controllers]. Unsatisfactory on both stations. Had a practice homing by puncture which turned out OK. Radio, AI [airborne intercept radar], and R/T [radio transmitter] were OK."
Flight 2: Beau #822, Practice Intercept (Stalecrust ground control), 10:00pm - 1:10 am. "PI with Stalecrust, Bishop 57 was playmate but went back with a rough engine so I stooged around until he got another plane. 57's I/C [intercept control??] went out on the first interception so he ran target for me. The control was very good, visuals at 1000 ft. Landing poor, very poor show." Oct. 28, 1943. Beau #806. Night Fighter Training. 2:30 pm t0 4:00 pm. "NFT with [Bishop] 59, his weapon was bent*, ship, R/T [radio transmitter] and AI [airborne intercept radar] OK."
Flight 1: Beau #819. S/L. 9:10pm - 9:50 pm. "Flew S/L with Bishop 53, A/C [air craft] seemed to run rough - control cable caught when turning port, R/T [radio transmitter] very bad so returned to base." Flight 2: Beau #760. Practice Interceptions with Stalecrust [ground control]. 10:00pm - midnight. "Flew PI with Bishop 53 whose weapon was bent* so he flew target. Joe Howard did a pretty good job of controlling but the night was dark as hell and I lost three visuals the first interception [required to visually confirm the target plane as "enemy"] Completed about 4 with target's altitude varying from 10,000 - 7,500. A/C [air craft] OK, R/T [radio transmitter] noisy."